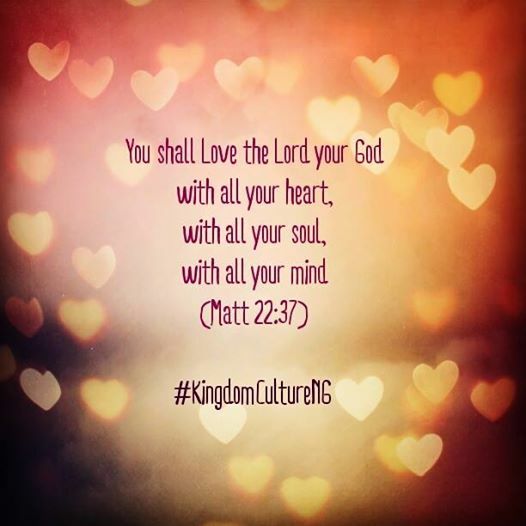 Today’s post has been culled from Kingdom Culture NG, a web-based community of God-loving people who desire to see the culture of God’s Kingdom manifested on earth. It seems to me that loving God in the good, the bad and I-don’t-have-a-clue moments in life can be a struggle in reality. While it may be easy to say or sing it out loud, it is in the doing (that is, making the conscious effort to daily surrender all areas of our lives to Him while loving the people in our world) that the true test lies. I therefore hope that the few lines below draws us back to what truly counts as believers and children of the Most High God. Enjoy and I wish you a God-loving week! This week we focus on loving God. Our maker, Saviour, Helper, Shepherd, Husband, Provider, Redeemer, Protector, Faithful One, our King, our Source, our Fortress, our Life our EVERYTHING!!! Nothing we can ever do, be, are, achieve can be compared to loving or knowing God. Infact nothing counts if our love of/for God is not the 1st priority. SELAH! Let’s make truly loving God our one desire and sole aim. Every other thing flows from that! It comes at a cost. It’s a conscious and deliberate effort we have to make. But it’s worth every single thing.